Rose of Sharon & Sedum has 10 gorgeous blossoms, clusters and buds. Click image to enlarge. Click Buy It Now Button below the image to purchase for $1.99 at my PayPal Store. Today I'm giving you a paper made with this kit. Enjoy! Ribbons 'n' Buttons 'n' Bees, OH MY! has the most adorable ribbon bees and gorgeous fabric flowers. There's two collections - one bright and one in muted grungy hues. There are seven gorgeous clusters with and without shadows to save you time! Click image to enlarge. Click Buy It Now Button to purchase from my PayPal Store for $4.99. Today I'm giving you a stud alpha. Enjoy! This was made with Ribbons 'n' Buttons 'n' Bees, OH MY! Buttons by http://www.storeide.se/gunhild/index.htm & http://Flashgraphicscreations.blogspot.com. Stamp not included. 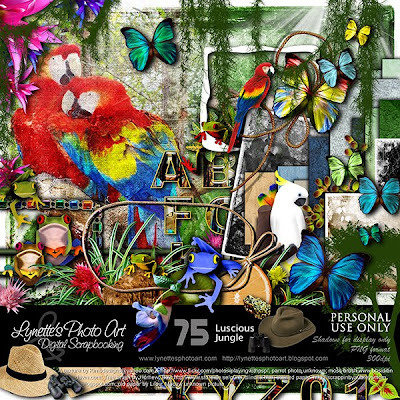 Luscious Jungle has 75 gorgeous pieces including many I hand painted including parrots, frogs, butterflies, worn papers, a sunburst through the jungle canape, hanging moss and bromeliads with rich blooms, an alpha, frames and so much more! Click image to enlarge. Click the Buy It Now Button below the image to purchase at my PayPal Store for $5.99. Today I'm giving you the Macaw to try the kit out. Enjoy! 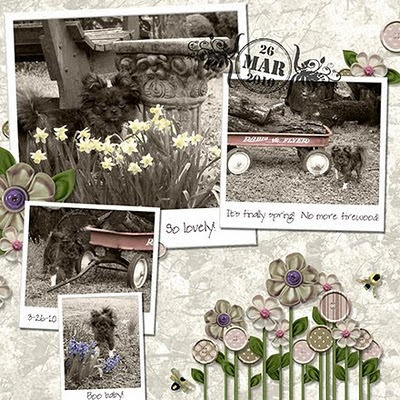 This is a 2 page layout I made using this kit and frames by those credited on the preview. There are frames in this kit, I was just experimenting. My husband does phone support for NASA. He just called and said he just got to help an astronaut IN SPACE! That's a first for him. We thought that was pretty awesome that he'd just gotten to "work in outer space" and talk to someone while they were up there. Pretty cool! Then he said, wasn't it sad that people are so impressed by things like getting to talk to someone in outer space, when we all have the ability to talk to the Creator of all that exists any time we want and we are unimpressed and disinterested? 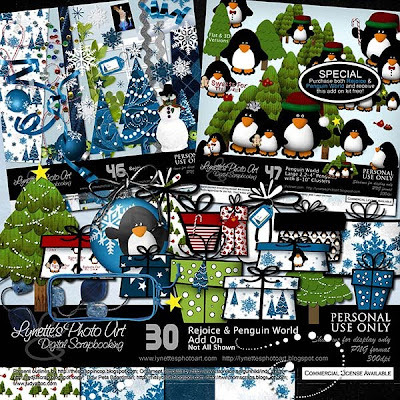 Today I'm giving you a piece from my Rejoice, Penguin World & AddOn Special Kit to sample. Complete details are here. Click image to enlarge. I love this kit so much that I've made two more pandas for it! If you purchased it with just 3 pandas, e-mail me at lynette@lynettesphotoart.com and I'll send you the 2 new darlings! 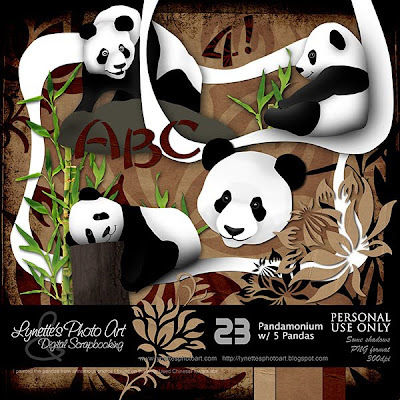 Pandamonium has 5 Pandas, 2 Panda Frames, an Alpha, Numbers & Punctuation, 4 Bamboo, 6 Flowers and 4 Papers. Click the image to enlarge. Click the Buy It Now Button below the image to purchase for $2.99 at my PayPal Store. Today I'm giving you a sample made from the kit to try out. This is a two page layout made from Pandamonium. 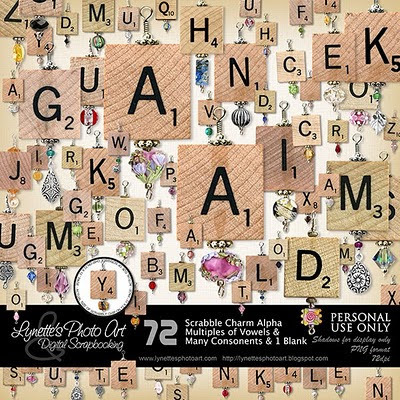 Note - the number four and exclamation point in the preview are the alpha with the black flower clipped to them. God made us with an empty place inside that only He can fill. He did this so that we'd seek Him and find Him and be whole and saved. Everyone has the need to fill that empty place spiritually, and with today's world turning against Him, they are trying in vain to the opposite spiritual things, those of darkness. That is why there is such a rabid thirst for entertainment like Harry Potter, mediums, vampires, role playing games. It will not satisfy and it will harm. 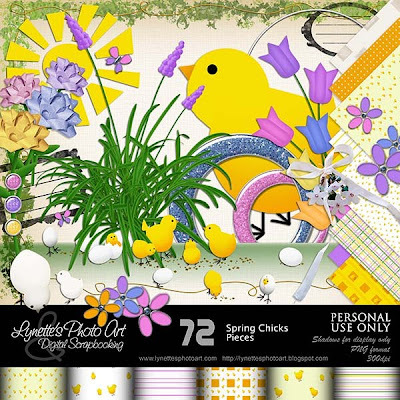 Today I'm giving you a piece from my Spring Chicks Kit to sample. Complete details are here. Click image to enlarge. If you are going to talk the talk - walk the walk! Many will never come to salvation simply because they have known those claiming to be Christians, but living sinful lives. I recently had a friend tell me about a co-worker who makes a point of telling everyone he's a Christian, then tries to sell them bootlegged cds/dvds. ???? We are ambassadors for Christ. If you aren't going to live it, then don't tell people you are a follower of Christ. 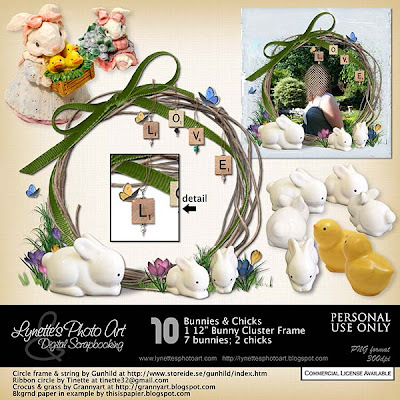 Today I'm giving you a piece from my Bunnies & Chicks Kit to sample. Complete details are here. Click image to enlarge. 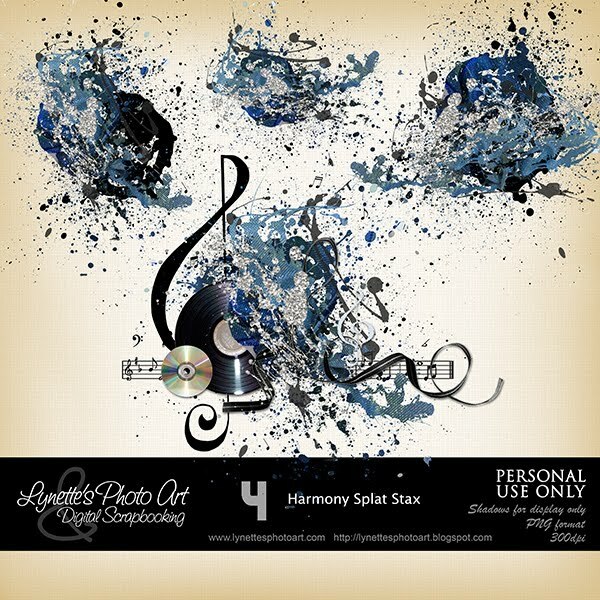 Dazzling Splat Stax has 19 rich, dimensional elements to tuck in behind things. 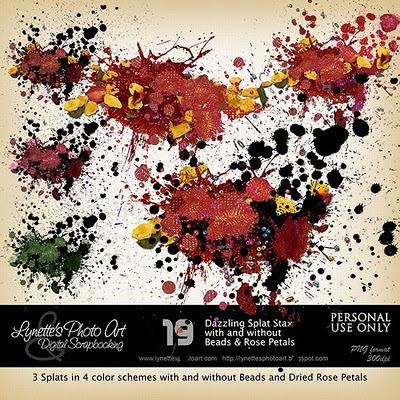 There are three elements with and without beads and dried rose petals in four color schemes for versatility. 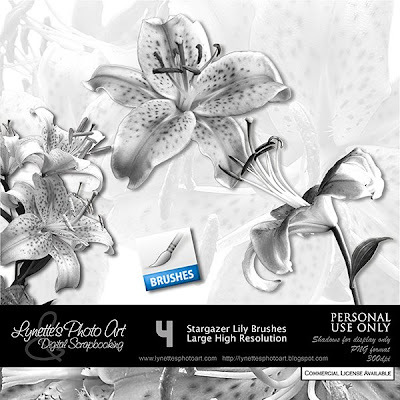 Click the image to see the detail - they are gorgeous! Click the Buy It Now Button below the image to purchase from my PayPal store for $2.99. Today's freebie is a ticket. You may have every right to feel the way you do, but if it's not profitable, change it. 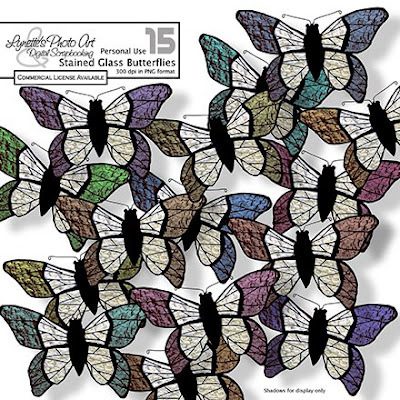 Today I'm giving you a piece from my Stained Glass Butterflies Kit to sample. Complete details are here. Click image to enlarge. My point is that the common excuse for not spending time reading our Bibles, praying, going to worship or other church activities is always that we "don't have the time". There never will be "enough time" as we instantly fill any time we have, yet we always find time to do the things we really want to do - the things that are most important to us. 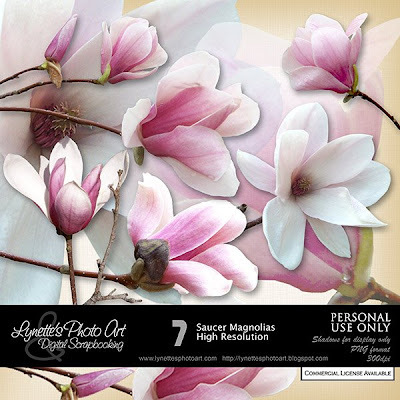 Today I'm giving you a piece from my Saucer Magnolias Kit to sample. Complete details are here. Click image to enlarge. What if everyone were as committed a Christian at your fellowship as you are ? Would there be toilet paper in the bathrooms or would the one who said they'd take care of it have bothered to be sure it was done? Would there be a class for your child or would the one who said they'd teach be too tired to come or not bothered to have prepared a lesson? Would there be a class for you or would the teacher have company and not show up? Would the praise team be able to lead the songs or would they have been too busy to practice or to even show up? Would there be a sermon presented or would there be a big game on TV? Would the doors be unlocked when you arrived to worship or would that person have felt a bit under the weather that day? When you go to a fellowship meal, would there be enough food for everyone, or would they all have left it for someone else to bring? When you come back the next week, would you find the room a mess because everyone left the clean up for someone else to do? Would there be VBS for your children when you show up, or would so many of them have not kept their word to work at it that they had to cancel VBS? Not lying is one of the Ten Commandments. When we say we will do something and don't do it we have lied. When we make a "commitment" to others, they are depending on us to keep our word, not to let everyone down for no good reason. What if every Christian were as committed to Christ as you are - would the church's bills be paid, missions funded because everyone gave the whole tithe and offerings as the Bible commands and when you aren't there for a week, you make up the amount you should have given if you'd been there? Or...would the church property be up for sale and the missionaries called home for lack of funds...if everyone were as committed to Christ as you are? What if every Christian were as committed to Christ as you are - would the lost hear the saving message of Jesus Christ? 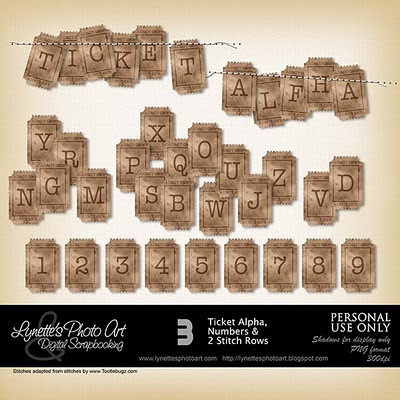 Today I'm giving you a piece from my Ticket Alpha Kit to sample. Complete details are here. Click image to enlarge. Today's thought was sent to me by one of the dear people who follow this blog. It's a powerful and important message and she gave me permission to share it. Thank you Sandi! "My dad was a minister. He was an amazing man, a terrific father, and my hero in every way. The last 20 years of his ministry was spent in patching up broken churches. He was extremely good at that because he was a man of unfailing integrity, monumental kindness, wisdom non pareil, and tact beyond belief! The page about him i selected to send to you is about a memory i have of going to the grocery store with him when i was in high school - a junior, i think, i loved being with my dad, but on this trip, he embarrassed me as only a HS student can be embarrassed by a Godly father! The clerk packed our groceries in a box that advertised beer and my dad objected, telling the high school box boy that he would not "advertise for the beer companies" and he wanted the groceries packed in a different box. On the way home i let him know just how embarrassing that was and told him i didn't think it was any big deal because everyone knew he didn't drink. He said, "Do you really expect me to sacrifice my integrity so you are not embarrassed by my values? If I do that, what will I have taught you other than integrity is optional and circumstantial? They are neither, so be prepared to be embarrassed by my from time to time. That's the quote on the page. It means a lot to me now because that's exactly who my dad was - he was kind, wise, and had an integrity i could count on. He died when i was 22, and not a day goes by that i do not miss him." 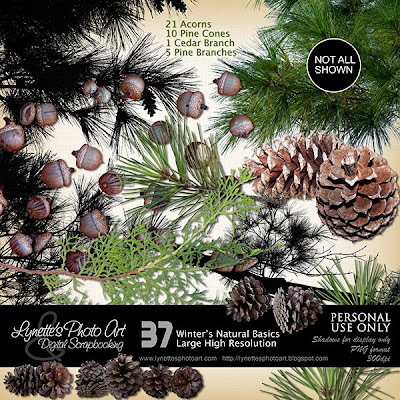 Today I'm giving you a piece from my Winter's Natural Basics Kit to sample. Complete details are here. Click image to enlarge. There are SO many insidious ways we can step off that narrow path that leads to heaven. One of the subtle ways we can wake up one day and find our relationship with God has become distant, cold and broken is being in service to Him. What? If you are spending every day serving Him with all your might, how could this happen? It can happen because the very service we render takes time and effort, often a draining amount. We can slip into spending all our time on the "things of God" and little or none actually "with" Him and in our zeal to serve, not even notice the change. Without regular quality time with Him, we are, in effect, causing our umbilical cord with Him to shrivel and ultimately die. Our service to Him may continue, but it is in our flesh, not in His Spirit and we may not even notice the difference for a long time. Our relationship with Him requires continual contact to thrive. It starves and dies without it. We must be vigilant to ask the Holy Spirit to search us and be our guide to proper balance between serving Him and being with Him. 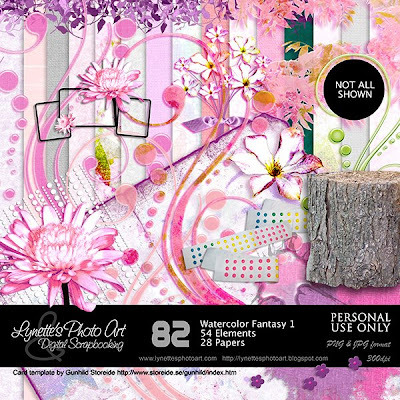 Today I'm giving you a piece from my Watercolor Fantasy Kit to sample. Complete details are here. Click image to enlarge. In Matthew 25:14-30 Jesus taught the parable of the talents. Don't confine your understanding of this teaching to only money (which is what the talent in the parable was). The principle He was teaching us was that any blessing or ability He gives us is to USED in His service. He didn't give it to us for our pleasure, but rather entrusted it to us as His servants, no matter what it is. They are given to us, His servants, to be USED in service to Him in His kingdom. Every one of us who has heard His plan of salvation has been given the pearl of greatest price, the greatest wealth. Matthew 13:45,46 If we share it with others, His kingdom increases as souls are saved (just like His wealth with the talent parable) and we have been faithful. If we share His plan of salvation with as many as possible, we reap the 100-fold increase and you may note that not only did our Master say He was pleased with this servant, but He took what the first servant had, which he had done nothing with, and gave it to this servant! Make use of this day the Lord has given us - be a worthy servant! Be rich in good works and serve faithfully that you might one day hear Him tell you, "Well done thou good and faithful servant! Enter in..." 1 Timothy 6:18; Matthew 25:20-22 Isn't that what it's all about? Nothing else matters in the end. He loved you so much that He sent someone to you to share the gospel that you might be saved...He also loves everyone else that much and when you gave Him your life, you made yourself His servant, His ambassador on earth. 1 Corinthians 4:1; 2 Corinthians 5:20 We are His voice, His hands and His feet. In what bazaar imagination does a "servant/slave" take his leisure doing exactly what he wants every moment of every day, ignoring His master's commands and expects all to be well? Christianity is ACTION not sitting! 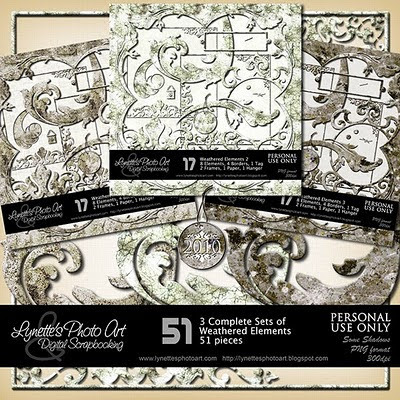 Today I'm giving you a piece from my Weathered Elements Kit to sample. Complete details are here. Click image to enlarge. Most of us come to an age where we become aware of a world larger than ourselves and the fact that our lives have a time limit. We discover a world full of needs and causes. Given that our time is limited, we should consider which causes are most worthy of investing our time and energy in. Of course, we can give time to more than one cause, but we need to weigh what is most important and focus our energies where they can do the most good. I can give you money, but you will need money again. I can feed you when you are hungry, but you will be hungry again. I can help provide medical care when you are ill, but you will be ill again. I can help rebuild your home after a disaster, but it will fall to rubble in time. I can provide social counseling and opportunities in efforts to improve your life, but you will always have difficulties and needs. I can plant trees and work to ensure that the natural world survives for our children and grandchildren, but there will come a day that this world ends. I can campaign to protect women, children and animals from being abused, but it will continue. I can work against evils in our society, in politics, in the workplace, but they too will continue. All these things help only for a moment and then they are overshadowed by new needs and are forgotten, no longer of help. Where can I bring the greatest, longest lasting good to mankind in the limited time I have on this earth? I can share the way to eternal life with the world. I can share the fact that God loves us, longs to be with us eternally and has made a way for that to happen through His only begotten Son, Jesus Christ. I can share the truth that unless we repent of our sins and ask Jesus to be our Savior and then live lives of faithful obedience to the World of God in the Bible, there is a sure eternity of hellfire and unending misery, away from the face of God, awaiting every one of us, with no possibility of relief...ever. Won't you consider what cause you are spending the precious moments of your life on? 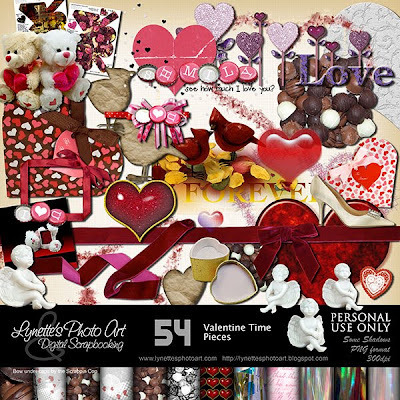 Today I'm giving you a piece from my Valentine Time Kit to sample. Complete details are here. Click image to enlarge. I would like to encourage all my brothers and sisters-in-Christ to live transparent lives and not secret ones. Our Heavenly Father wants us to share what He's done in our lives, as not only glory to Him, but encouragement to those around us also going through difficult times. The love and strength He gives us is not for us alone - He tells us to give it to others. If we live secret lives, never letting our brethren know what God has brought us through, He receives no glory, we are not exalting Him as we told to, and we are not sharing His strength and love with others which would encourage and uplift them. It would be selfish indeed for us to care more about trying to make others think we are these perfect people, (the sin of the pride of life), when we could instead be bearing one another's burdens and thus fulfilling the law of love. 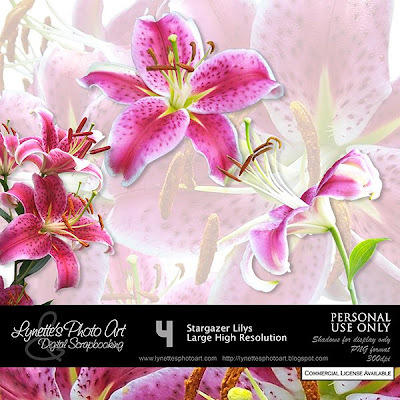 Today I'm giving you a piece from my Stargazer Lily Kit to sample. Complete details are here. Click image to enlarge.
" 4so that the requirement of the Law might be fulfilled in us, who do not walk according to the flesh but according to the Spirit. 5For those who are according to the flesh set their minds on the things of the flesh, but those who are according to the Spirit, the things of the Spirit. 8and those who are in the flesh cannot please God. 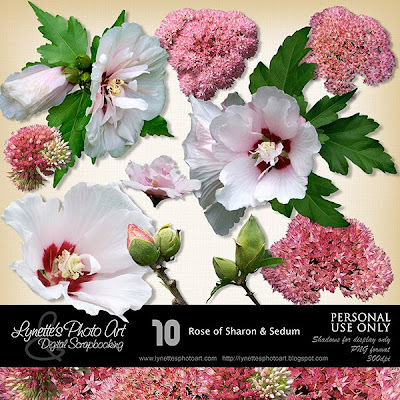 Today I'm giving you a piece from my Rejoice, PenquinWorld &AddOn Kits Combo to sample. Complete details are here. Click image to enlarge. If you like it well enough to download, please leave me a comment at the bottom of this post as I have disabled 4shared comments. Please support this blog by shopping my PayPal store. God bless you!